Besides the LG G3, the Huawei Ascend P7 has been the most heavily leaked handset over the last few weeks. The Chinese manufacturer's next flagship device is expected to get a big send off on May 7th in Paris. The specs of the device are just about what you would expect from a 2014 high-end model, although a case could be made for 3GB of RAM instead of the 2GB that the phone comes with. And perhaps the 2460mAh battery could have been a higher-capacity cell. Why nit-pick? Because in a crowded market like this, it is getting harder and harder to stand out. Consumers these days are jaded, which leads manufacturers to try other means to achieve some sort of differentiation that can be used to hook buyers. If the specs can't do it, you go to design. And this is where the Huawei Ascend P7 comes in. With the handset measuring just 6.18mm thick, the Huawei Ascend P7 is more than 1.5mm thinner than the Apple iPhone 5s. 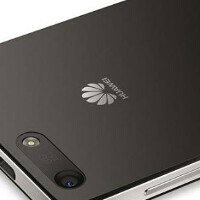 And you can check this out thanks to the leaked close-up of the phone, that was tweeted by master leaker evleaks. Judge for yourself just how thin the handset looks, by viewing the picture below. Soon as nexus became available in my country, skins became a phone cancer to avoid. It seems like they are using a lot of Apple design language. If they want to make the phone more like the upcoming iPhone 6, though, they should cut the RAM back even further, to 1GB. Faster at what? Some meaningless microbenchmark that fits into the meager RAM that Apple provides and runs fast because the screen resolution is so low? Meanwhile, in the real world, there are many thousands of complaints regarding app reloading, web page reloading, crashes, weird behavior, all because the iPhone has too little memory. Having used an iPhone, I would not go back. The camera is speedy and decent, the audio output is generally high quality. But for everything else, the iPhone is terrible. Some of this is due to the small screen, some of this is due to the Fisher Price mentality of iOS, and some of this is due to the insane greed of Apple (i.e. no indicator LED, only 1GB RAM, etc). "for everything else, the iPhone is terrible." lol. It's literally NOT terrible at anything. This phone looks a lot like a sony xperia smartphone.